My dear friend Debbi and her husband just sold their house in our neighborhood and will be leaving for their almost-finished home down south sometime later this month. Debbi is very fond of the color red (and over the past few years she has even convinced me it’s not so bad a color), so I put together this “riot of red” to honor our friendship, which I hope continues to flourish despite the distance. 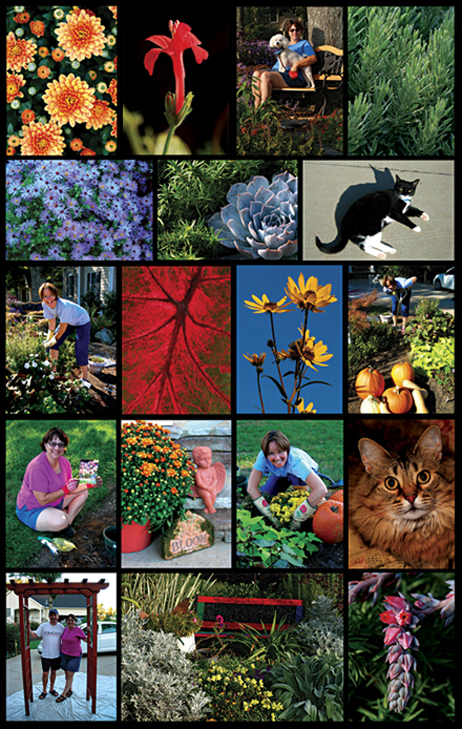 Debbi is my Garden Club’s resident rose expert—roses thrive under her care and many of the roses I have photographed (including all of those in the collage below) were grown in her garden. And because her cats are plant nibblers, I have been the recipient of many a fragrant bouquet through the years. Thank you for all the wonderful girls-day-out lunches and Coldwater Creek shopping and for taking such wonderful care of our house, gardens, cats and the multitudes of fish in my studio when we were called away for business, pleasure or family stuff (and you know that I have never blamed you when a fish died on your watch, contrary to what you may think). And thank you for being a creative inspiration to me and joining in on all those pranks we pulled on Sue! I know you’re looking forward to living in your home state in that beautiful new home (with your oft-dreamed-of red front door) on the hill, but I am going to miss you dearly, Cement Queen. I can’t wait to see the new house!